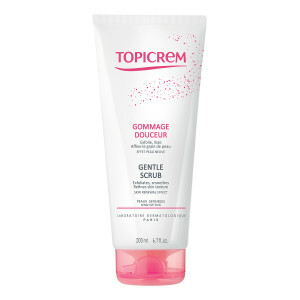 GENTLE SCRUB, soap-free gel enriched with jojoba microbeads, gently removes dead cells, smoothes and refines the texture of the skin while cleansing it gently. Suitable for sensitive skin. High safety standards: Tested under dermatological control. Soap and paraben free, formula without allergens. Respects sensitive skin : round shaped jojoba beads remove dead cells without aggressing the skin. Usage: Apply once or twice a week on wet skin, massaging over body and then rinse. Avoid contact with the eyes and rinse thoroughly in case of contact. Do not use on children.